Did you know you can now order your Deliveroo takeaway from Battery Park Juice Bar here on View? 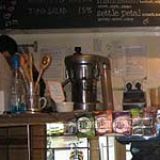 Battery Park Juice Bar serves a range of fresh juices, smoothies, hot and cold drinks as well as a variety of freshly made sandwiches, homemade soups and homemade cakes. Do you work at Battery Park Juice Bar? What did you think of Battery Park Juice Bar? Battery Park has been in Chorlton long enough to have seen many other venues come and go. The reason it’s survived: consistency, fresh produce and the best juices and smoothies for miles around. 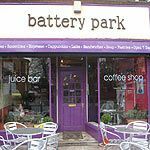 Battery Park sits one along from the corner shop (a locksmith) on Wilbraham Road, Chorlton. Way before Croma came and colonised the opposite side of the street, Battery Park went about its business in an unassuming way and to this day the menu has many of the same things it had nearly ten years ago. 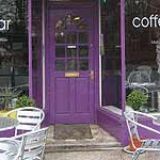 The shop front has bay windows either side of the front door and the colour scheme is a purple and beige colour. The sub header to the main signage tells you all you need to know about what they sell: juices, coffee, sandwiches and soups. It’s open seven days a week. Inside, it’s set out in a little mezzanine fashion. 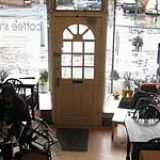 Tables and chairs populate the ground level, while up a set of small stairs is a glass counter, a coffee machine and wall mounted blackboards displaying all the wares they have to offer. Past this counter and round to the left and rear of the venue is another little room for the overspill of traffic. Battery Park gets very busy at peak times so this room sees a lot of action then; not so much at other times. The walls are painted a deep red colour and there are usually some trippy paintings of some sort on the walls. The mothers of Chorlton congregate at Battery Park. At any time of the day you will find mothers with prams, having a social, catching up or having a meeting of some sort. As this is Chorlton you will most definitely see a Guardian reader or several. Some people may even have done their shopping at local stalwarts like the Barbakan, Frosts the Butchers and Unicorn, before popping in for refuelling. If you do see people brandishing Unicorn bags (the strongest bags in the world, by the way), don’t start championing the virtues of Tesco – it could get ugly. Sandwiches, soups, bagels, baked potatoes, salads and delicious slices of cake are all on offer. The toasted cream cheese bagel is always a winner, but at £3 it should be. You can add a slice of roast ham for an extra 85p. Sandwiches are rotated fairly regularly and a tuna melt with cheddar and red onion is £4.15 (£3.60 to take away). All sandwiches and bagels come with some fresh salad on the side; the accompanying drizzle of balsamic-infused dressing is particularly good. Homemade soups cost £3.30 and are served with rye bread, and the delicious looking cakes that glisten under the lit up glass counter cost the same. Battery Park was one of the first juice bars in Manchester. And nearly a decade later it still does a roaring trade in its furiously blended fruit concoctions. In some circles, the Raspberry Razzle smoothie (tropical juice, raspberries and banana, £3.15) is as much part of Chorlton folklore as the 86 bus and the smell of freshly baked bread wafting out of the back of Barbakan every morning. The juices (£2.45/£3.15) are made up of super healthy concoctions like the Detoxifier (beetroot, ginger, cucumber and apple). Most of them are like a meal in themselves. 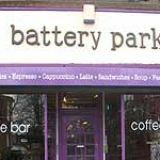 Battery Park is one of the independent businesses that gives Chorlton its unique character. Long may it continue. rasberry razzles are the one off their smoothie menu!